The Restaurant Pizzeria San Francisco, which features a large air-conditioned lounge and a covered outdoor veranda, is the ideal location for a romantic twin dinner, but also for families with children or for business meetings and ceremonies of all kinds, such as weddings, Baptisms, first communions, birthdays and anniversaries, corporate and group dinners or any occasion you wish to celebrate. 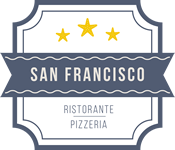 At San Francisco Restaurant you can enjoy fish or meat dishes, typical of traditional Sardinian cuisine or International cuisine. The Chef will be able to advise you best among a wide choice of appetizers and courses to which to associate a selection of regional wines, or between a wide choice of soft pizzas cooked in a wood oven, or even among the desserts of the typical tradition of the Gulf of Orosei. Availability is also great for those who have particular allergies or food intolerances: our kitchen staff will ensure that your dietary requirements are met. For reservations or ordering lunches at the San Francisco Restaurant call us at (+39) 078493217.